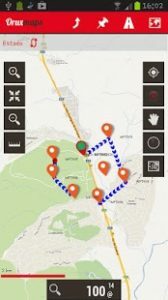 OruxMaps : Map viewer, track logger. OruxMaps format. You can use maps from Ozi Explorer transformed with a PC tool. .img garmin (vectorial) – no full support is provided. .map (vectorial from mapsforge). Support to custom themes similar to Locus themes. Heart rate monitors, bluetooth Zephyr, Polar (including bluetooth smart devices, like polar H7). ANT+ (speed, cadence, heart rate, distance, etc.). AIS information systems (experimental), for nautical sports, using Wi-fi or bluetooth. Lovely Very useful map app!! Thank you! Best GPS app by far. Very customizable, and preferences and maps can be saved and transferred between devices. I love OpenCycleMaps. Only complaints are very minor GUI things. Complicated and clustered interface, but still the best. This app has way too much going on. It’s very complicated. This is good in a sense because it’s very powerful. It also bad because it’s confusing. I guess you just have to spend a lot time to figure it all out. The price is right and compared to almost all other GPS apps it is king. What it is really missing is a proper desktop app for route planning and especially map conversions. Great great work dude :o) This app allow people to make very good field work. I used to record GPS data for scientific research and thanks to you my mobile is now a research tool. And thank you for making this app FREE!